STOP HS2 | HS2 campaigners urged to respond to consultation before land take increases. HS2 campaigners urged to respond to consultation before land take increases. UPDATE – The petitioning period will take place from 19th September to 17th October. Those who have already submitted petitions will not have to pay £20 again. The Stop HS2 Campaign is urging people who are affected by HS2 proposals to get in their responses to the current compensation consultation quickly, before the Government announces changes to Phase 1 on Tuesday, 9th September, which will increase the required land-take and trigger the start of a second ‘opportunity’ for affected individuals to submit petitions against the Hybrid Bill. Despite there having been no forewarning to affected individuals and existing petitioners against the HS2 Hybrid Bill, HS2 Ltd will publish ‘additional provisions’, which will make changes to the HS2 proposal along Phase 1 of the proposed route following what is expected to be a short Parliamentary debate on Tuesday 9th September. The only communication there has been with communities about the publication of additional plans were emails in June to arrange delivery of documents to selected village halls and libraries. Last week, HS2 Ltd issued a low-key email to some press outlets, but decided against publishing a press release on their website. It is claimed that the most significant issue which will be covered within the additional provisions will be to increase the land-take required during the construction of HS2. The only public acknowledgement by HS2 Ltd of the publication date has been a one word tweet to the Stop HS2 Campaign Manager. amendments to accommodate the requirements of landowners and occupiers. amendments to accommodate changes to the design of the works authorised by the Bill. amendments to accommodate the requirements of utility undertakers. Despite the HS2 Hybrid Bill Committee, who are currently hearing petitions, saying that they might consider skipping ahead to London to try and get petitions concerning the redesign on Euston Station done before the General Election, the London Boroughs are the only local authorities not listed as being home to additional provisions, meaning that the redesign of Euston Station is not complete and there will have to be both further additional provisions and another petitioning period at a later date for those changes. Also, whilst the Davies Commission has not fully reported, they have confirmed that their recommendation will be that Heathrow Airport remains at least in its current form, so the reasons for suspending the designs and cost of the proposed HS2 Heathrow spur have been eliminated. This means that there will have to be another future set of additional provisions concerning this link at some point in the future. As soon as the details of the additional provisions are published as planning notices in the press, a second four-week period for individuals, businesses and local authorities to submit petitions will commence. This is expected to run from 19th September to 17th October. Stop HS2 is lobbying for those who have already submitted petitions to be exempted from having to pay the £20 charge again. ++UPDATE It has been confirmed that those who have already submitted petitions will not have to pay £20 again.++ Also, as the substantive part of the carry-over motion submitted by the Government is to allow them to publish details of the changes electronically, we are lobbying for at least those who have already submitted petitions to be able to do the same, and not to have to submit multiple copies of printed petitions physically to Parliament. 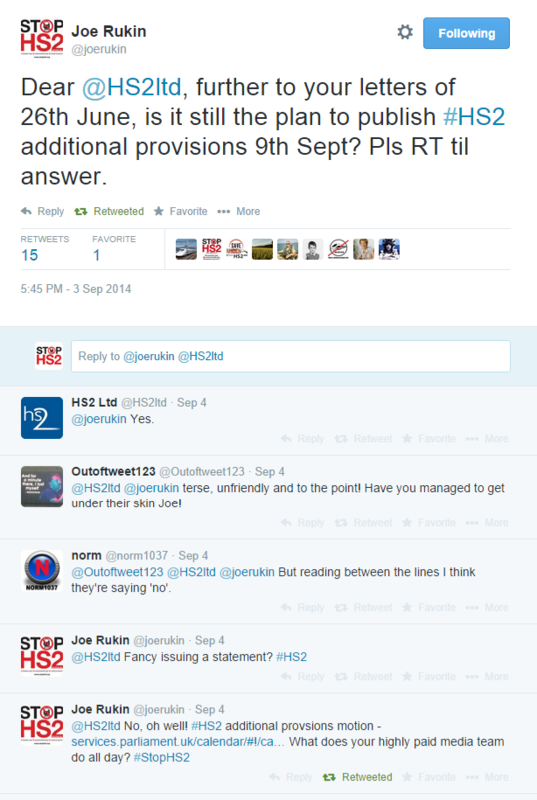 Given that understanding and petitioning against additional provisions will require considerable time and effort by those effected, Stop HS2 is urging people to respond to the current compensation consultation, which concludes on September 30th, as soon as possible, and as such have set up a quick response form on their website. This week, the Government has announced the long awaited final plans for Phase 2 will be announced in ‘autumn’. Pingback: STOP HS2 | “A reasonably comprehensive contact programme” on additional provisions say HS2 Ltd.